You might have read what it says in the little about box to the right. ‘London mum and wannabe illustrator’. It’s a dream, but nothing that should be left untried. And now that little L spends some time at the nursery, the excuses for me not to pick up my pen and draw are running thin. When I was pregnant, I started writing a children’s book. That’s about a year ago. Recently, I de-dusted the sketchbook and started working on the illustrations for the story. The whole thing is plotting along rather slowly, and with posting about it here, I hope to put a bit of (positive) pressure on myself. Let me introduce you to… the monster. She plays the lead role. Enough said for now. The pressure is on. I am off sketching. What a lovely monster! And what an excellent plan. It helps me to work on a project at the same time as someone else is working on a similar project so we can share stories, give support, complain, and put the pressure on each other. Now that you’ve made this announcement, perhaps that will give you the pressure and momentum you need!! Have fun with it! I have a little favour to ask of you, if you have a moment, can you please email me? Oh wow, that is really good…seriously, I love it! I can’t draw at all so I am full of admiration for those who can. Well done to you….it is a challenge to make time to do the things we love – and things that aren’t housework! Oo a girl monster – I am intreigued. That monster looks lovely! Scary, but lovely. fabulous! if the monster is indicative of what’s to come, i can’t wait to see the rest. lovely! Loving the monster! Definitely makes me curious for more! Yes I was intrigued when I first read you’re a wannabe illustrator. Lovely sketch! Show us some more pics please soon! Very interesting concept, I hope you keep us posted on your story’s progress. Go for it. 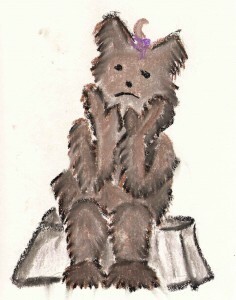 A cute little drawing – doesn’t look very monsterish though. Good luck – hope we hear more. What an adorable little monster, I look forward to reading about her adventures. And good job you for working towards your goals. You have your main character, and that’s the first step! I like him/her! Lots of possibilities there! Have fun with it! How exciting! I think this is wonderful. Let us know how you get on. No pressure! Awww, the monster looks cute. Good luck with it all. You are a real talent MM. This clicker thingy is now, however, sorry to moan but it hates me!! What a fantastic little monster, I think you’ll go far! oooh that’s exciting. Have you a story line? Love the monster. Good for you! Ooh this is very exciting. Look forward to seeing and hearing more. Ooh very exciting. Look forward to hearing and seeing more about it. well done you. love the monster. I have a friend who is a children’s author and illustrator and it amazes me still how long it takes to produce her books (and I mean that nicely) so don’t be tough on yourself timewise. ahhh, i love the little monster!!!! i’m not an expert or anything, but i bet you’re on the right track! Next PostThe worst political campaign ever?